Data modes can seem overwhelming to newly licensed radio amateurs, but they don't have to be. 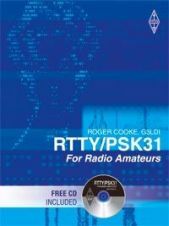 RTTY and PSK31 for Radio Amateurs is the most practical guide on the two most popular data modes used today. This expanded, and fully updated second edition is 50% bigger than the first edition, providing everything you need to know to get the most out of this fascinating area of Amateur Radio. CD included! The CD provides Amateur Radio data mode programs to get you started. Includes equipment reviews, reference material and web links.